M31 The Great Andromeda Galaxy allows astrophotographers to produce stunning wide field images such as image. 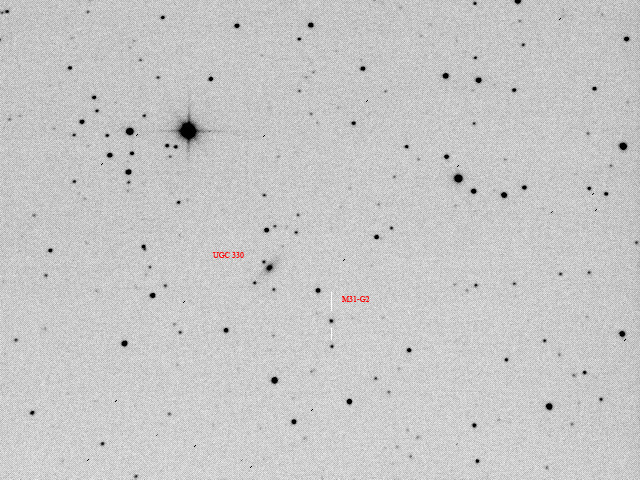 However, I do not have ideal equipment for imaging a DSO that is several degrees across! However, M31 contains a large number smaller (and, to me, more interesting) objects to hunt down. The starting point for any such work has to be the fabulous Atlas of the Andromeda Galaxy. Using this work and a number of other references, its possible for the webcam imager to track down numerous open clusters and globular clusters in another galaxy! Many of these are visually unimpessive, but its the thought that counts. Over a couple of evenings I have hunted down a small sample of these objects. 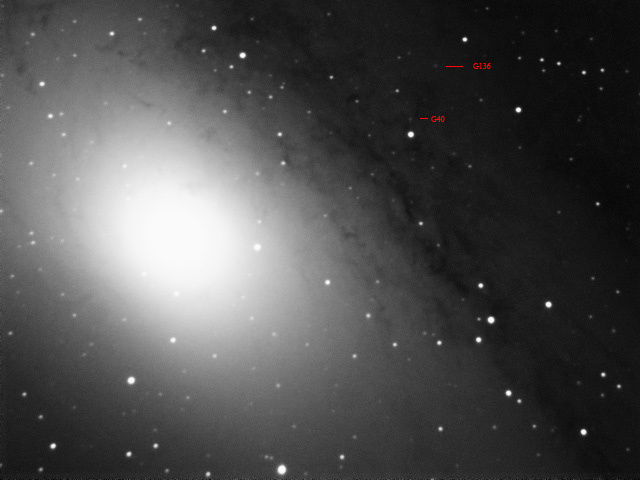 The first image above is of the core area of M31. The inner dust lanes are visible. 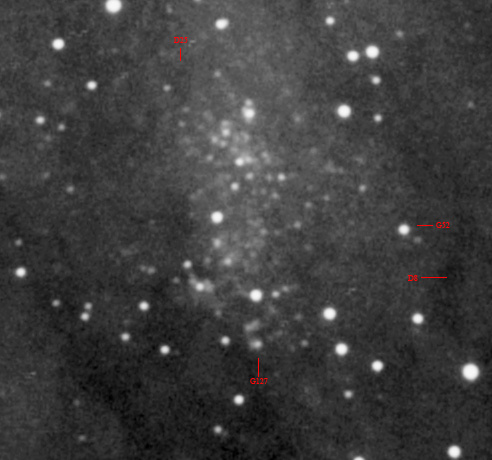 There are large numbers of catalogued objects here, I have highlighted a couple of globular clusters. Compare this image with this chart from the atlas. Globular clusters in the M31 Andromeda galaxy are refered to as G1, G2, G3 etc etc. Dark regions are D, clusters C and Stellar associations A. There are hundreds of catalogued globular clusters in M31. They appear as points of light, so its quite arbitary to choose which to image. I have chosen the first two: G1 and G2. 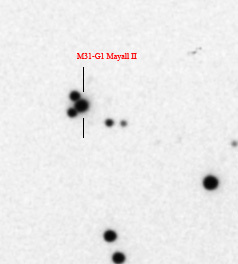 G1 is also known as Mayall II. A famous HST image of this object makes it look like a globular cluster in our galaxy! To my equipment it appear as a slightly non stellar object. It forms a tight triangle with two other stars. G1 is fairly well documented, imaged and dead easy to find. G2 proved more tricky for me - I struggled to find an image of M31-G2. Careful examination of the image below with the co-ordinates leaves me fairly convinced I have the right object highlighted. The globular cluster G2 in M31 is just south west of the faint galaxy UGC330. A picture of both G1 and G2 is here. 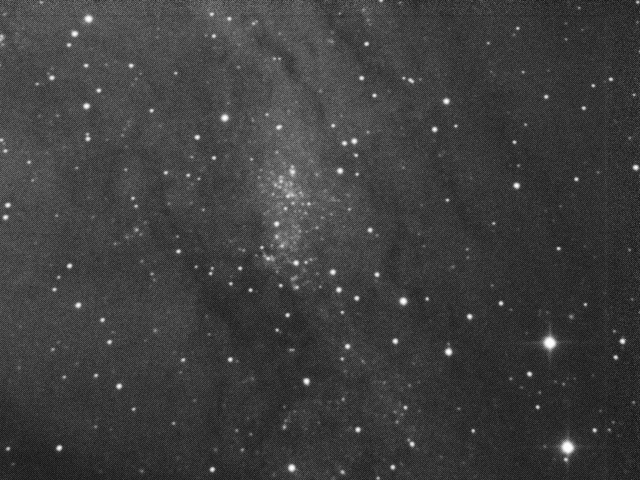 Finally we have everybody's favourite M31 object, the huge cluster NGC206. Compare the image below with this chart. This region is a mass of packed in objects in the catalogue. I have also enlarged the cluster region of this image, resampled 2x. Some features have been labelled. Richard Crisp has a fine reference image of this object. In november I made this colour image of the region with is an improvement. I have mislabled G127 in the above image. It should be C127, a cluster. All these images are taken with my 200mm/1000mm newtonian with a black and white SC3 modified webcam. Exposure times range from 30s to 60s. Each image is a stack of 10 to 20 raw frames.